As the presidential candidates start jostling to take over from beleaguered Sepp Blatter at FIFA, here I provide an update of my “FIFA Reform Scorecard” to set the stage for evaluating the claims that the process has already started and highlight what is left to do for his potential successors. Blatter has expressed a desire to implement reforms before but unfortunately, these past announcements were mostly illusory. We can show this with some simple accounting. After FIFA’s so-called Independent Governance Committee put forward recommendations in 2012, I compared FIFA’s subsequent actions with those recommendations. I also compared FIFA’s actions with the recommendations of Transparency International and those of Mark Pieth, a Swiss governance expert who FIFA hired to develop proposals for reform and then to lead its IGC. I also evaluated the significance of the reforms using the framework of Jean-Loup Chappelet and Michael Mrkonjic (CM13 in the slide below and here in PDF). FIFA’s performance, summarized in the slide below, was not very inspiring. You can read all of the details of what I found in a book chapter found here in PDF. Blatter has framed his reform agenda in two parts. First, he has announced his intention to step down upon the election of a new president on February 26, 2016. Second, he called for FIFA to implement the balance of proposals recommended by the FIFA IGC, focused mainly on salary disclosure and integrity checks. Blatter announced that an 11-person committee would be established to help finish the uncompleted work of the IGC. I was curious as to what (hypothetical) full implementation of the IGC recommendations would do to the numbers in the reform scorecard. 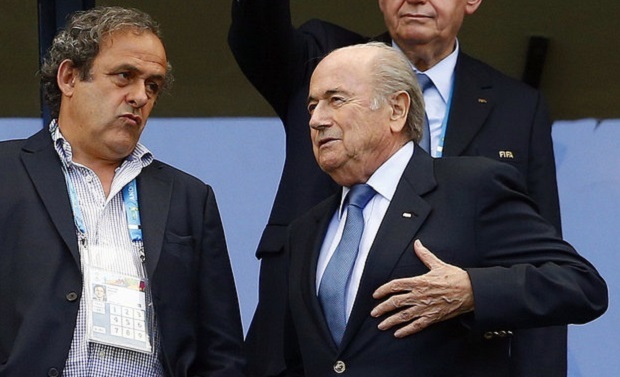 Perhaps they show that Blatter has now become a true champion of FIFA reform? The recommendations of FIFA’s IGC were already fairly weak, as compared to those advanced by TI and Mark Pieth (pre-IGC). So full implementation of them would only represent a small step forward. 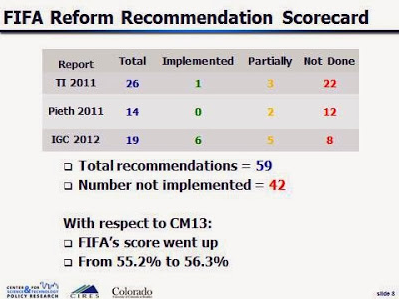 Using the Chappelet and Mrkonjic framework the graphic below shows the effect of full implementation of all reforms proposed by the IGC but thus far rejected by FIFA. FIFA’s score would increase, but only by a little, most notably in the area of reporting, due to the proposed salary disclosure for all FIFA officials. 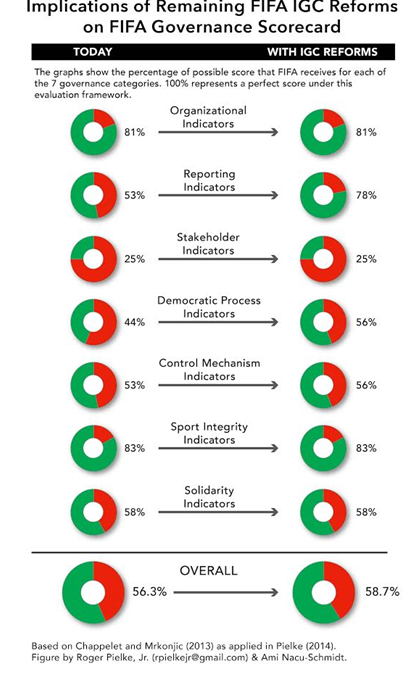 The use of the MR13 framework does require some judgments, so it is quite possible that we might quibble over whether FIFA’s score would be closer to 55% or 60%. But we would not argue over whether it was closer to 60% or 90%. For comparison, in 2012 CM13 gave the IOC a score of 70.2%. What alternatives might be missed if we focus on the FIFA presidential horse race and the IGC recommendations? You can see further details on specific reform proposals summarized in my recent book chapter on the reform process here in PDF. Beyond that summary, there is no shortage of good ideas for FIFA reform (see for instance here), as best practices for good governance in business, governments and in civil society are generally understood. For FIFA the challenge has been how to get from where it is to an organization that implements those practices. As long as FIFA is led by people like Sepp Blatter who “kicks the ball out of the field” to distract attention for meaningful reform, then changing the organization will remain difficult. In focusing attention on the unimplemented IGC recommendations, Sepp Blatter has indeed laid down his mandate, and it is not very impressive. As candidates declare for the February presidential election, they should be asked to commit to which reforms they support as part of FIFA reform. Fortunately, we have a long list of recommended reforms and frameworks against which to evaluate their significance (such as CM13). Any candidate who does not commit to a specific reform agenda that can be rigorously evaluated can be said not to be serious about meaningful change in the organization. And we already know what that looks like.